State House, Freetown, Sierra Leone 27 March 2019 – President Julius Maada has told NewAfrican Magazine, a trusted authority and leading publication on Africa covering the international investment conference in Casablanca, that the Rule of Law in Sierra Leone is supreme. Julius Maada Bio took office as the President of Sierra Leone one year ago after winning a run-off Presidential election against Samura Kamara of the All People’s Congress (APC) in March 2018. Bio’s victory took many observers and pundits by surprise as the APC had dominated the political landscape for over 10 years and their candidate was widely expected to sweep the board against the Sierra Leone People’s Party’s nominee. Bio’s relatively narrow victory (51.8% against 48.2%) nevertheless reflected the mood of the public, which had lost patience with the successive APC administrations. This was in fact the second time that Bio had become the head of state of this West African country. He was one of the group of young soldiers, including Captain Valentine Strasser, that had staged a bloodless military coup against President Joseph Saidu Momoh in 1992. The National Provisional Ruling Council led by Strasser ruled for four years before a second internal coup, led by Bio, ousted Strasser in January 1996. 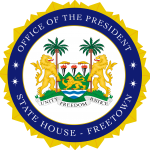 Two months later, Bio handed power to Ahmad Tejan Kabbah of the Sierra Leone People’s Party, following Kabbah’s victory in the 1996 Sierra Leone Presidential election. Bio moved to the US, where he was granted political asylum and acquired a university degree. He returned to Sierra Leone in 2005 when his safety in the country was guaranteed by Sierra Leone’s then President, Ahmad Tejan Kabbah. Bio inherited a country whose treasury had been looted by the previous administration and which was still reeling under the ramifications of the Ebola epidemic. The IMF had withheld financial support because of poor governance and mismanagement. New African met President Bio at an international investment conference in Casablanca, cohosted by Attijariwafabank, where he was guest of honour. He had also just returned from important meetings with the World Bank and the IMF in Washington DC. NA: After one year in power, have you changed your vision and strategy on Sierra Leone in the face of the realities on the ground? What do you see as your biggest challenge? President Bio: My vision has not changed. In fact I am more focused on it now than before I took over the leadership of my country. What is my biggest challenge? That is not so easy to answer. Consider this: I took over a government that was on the brink of collapse in terms of the economy; one that had already been abandoned by the IMF and one that was extremely corrupt. All this meant that we had to start from scratch in every department of government – in a nutshell, to reorganise everything, starting with changing the mentality of our people while looking at financial resources, in order to undertake the social programmes that we want. Without doubt, we are more focused now, the vision has not changed – the primary goal being to enhance the human capital as a means of spearheading our country’s development. How did your discussions with the IMF and the World Bank go? Since last year, we have been able to fulfill all the conditions set by the IMF. These have been to devise and implement stringent economic management, prudent management of our resources, expenditures control, revenue mobilisation and reforms in the economic sector. All of these activities that we conducted seriously were enough to convince them that we mean business and that we want to put the economy on the right footing. We resumed relations with them since last year. Once the IMF gives us a clean bill of health, all the other financial institutions normally come on board. We have had very useful discussions with the World Bank, and they are very happy with how we have managed the economy so far, and they want to encourage us to continue on this path. They have very good packages which will land in Sierra Leone very soon, to help us maintain the progress we’ve achieved already. NA: What are the time-frames before you re-engage with the whole financial community? President Bio: We have already engaged with all of them, in terms of budgetary support and in terms of all the support we need to effectively take on certain infrastructural and social problems. The budgetary support is already running. NA: In line with prudent macroeconomic management, last October you cancelled a $400m contract for the new airport. Is that part of your drive for stronger management of the economy and keeping domestic and external debt manageable? President Bio: That is one of the actions that we took. In addition, we established a single treasury account. Before then, most departments of government had their own accounts, held in different banks accounts under their control. What we have done is to make sure that all monies go into a consolidated fund from where they are managed. We are controlling expenditures to make sure that we don’t spend more than we can take in at any one point in time. We run the country wisely. We have made a serious dent in revenue collection; duty waivers have been taken off, except for in those cases that merit it. We have been able to stop the haemorrhaging of the economy. We have paid all salaries on time for nearly one year. Before we took over, the former government had to borrow money from the bank at the end of every month to pay salaries. We have also been able to raise enough money to launch a new programme – [to meet] our electoral pledge of free quality education. We have managed to control expenditures but also raise enough revenue to take care of the day-to-day affairs of the country and to launch ambitious projects, like that of free quality education. Do you think that the extra revenue has been realised simply by eliminating the leakages? President Bio: Yes, blocking the leakages; making sure that the tax administration is effective and also, making sure that our expenditures are properly controlled. When you do that, you are ensuring that you have enough revenue to take care of the essentials. NA: You have said that tax revenues should be 20% of GDP, which also means that you need to show concrete results to maintain a social contract between the government and its people. What are your taxation revenues as a percentage of GDP today? President Bio: When we took over it was just a little over 11%. Now we can talk about 15% of GDP in 11 months. We are getting there, we hope that with time, before the end of my current term in office, we should be able to achieve our target. NA: Have you been able to harness the mining and oil & gas sectors as catalysts to drive economic growth? President Bio: The extractive industries, as you know, have not been contributing as much as we actually expect from them. There is nothing coming from the oil and gas industry. There is no activity whatsoever at the moment. This is the result of mismanagement. Worse, most of the players departed our shores. We are trying to lure them to come back because we have promised them that we will be able to give them a corruption-free administration, that the activities would be transparent and viable – which wasn’t the case before. In the extractive sector, except for some long-term establishments, many mines have closed or are not operational because of challenges with international commodity prices. The contracts and agreements therein are also not favourable. We are trying to review all of that to restore sanity to the sector so we can take in at least what is due to the state for social programmes. A new mining code is on the way. NA: What are your priority sectors – agriculture, power or mining? How do you intend to get the economy back to double-digit growth? President Bio: For a very long time we depended on mining. We are trying to bring stability to this sector through greater transparency and the implementation of a mining act that will benefit all actors, investors and the people of Sierra Leone. The geophysical survey of all our mineral assets within the country is ongoing, and in a few months we should be able to know the [scale of the] resources we really have. That has never been done in the past, we were just operating on an adhoc basis. That is one example of how we are bringing sanity to the industry. Other areas include the blue economy – fisheries, tourism – and agriculture. A lot of focus is going into these sectors. The private sector is very important in all of this. Which is why we are also emphasising developing human capital, to ensure we have the skills to support the private sector. We spend 21% of our budget on education and strengthening human capital through vocational training and other programmes. NA: You stated at the Africa International Development Forum in Casablanca that investment backed by a sound ecosystem is part of your strategy. What does that mean in practical terms for domestic and foreign companies? President Bio: Making sure that the business climate is such that the private sector will feel comfortable to come and start a business, that the environment is attractive enough to lure the investor community. For example, we want to make sure that setting up a business is quick and affordable. We have therefore reduced the process to three stages, and you can now register a business in just 24 hours. We have also made sure that we have set up an investment board, which is going to be presided over by myself and the Vice President. The board will act as a one-stop shop for those who want to invest in Sierra Leone. Once we approve of an investment, we will make sure, between myself and the Vice President, that investors can go about their business without wasting time and money. We’ve also shaped up the investment code and established incentives such as tax breaks for different kinds of businesses. We have also tackled various areas of corruption. Corruption adds to the cost of doing business and impedes genuine investors from coming into the country. NA: What’s been your experience in terms of eliminating corruption? People talk about the need to eliminate corruption, but how easy or difficult is it to actually implement? President Bio: It’s a very lucrative proposition and we must not fool ourselves – it is never easy to get rid of corruption. This is not something that just we in Sierra Leone have to contend with, it is a global problem. The world over, people know that the best thing to do about it is to reduce it to the bare minimum, to cut it to the point where it cannot choke the development process. Let’s also face this stark fact: human beings are greedy and they are prone to take a pinch for themselves, however tight things are. When it becomes the norm to the point it risks strangling the development process, that is when it becomes a threat to the nation and that is when we have to tackle it head-on. That is the situation we had reached. Unfortunately, we have been considered one of the most corrupt countries globally. That’s not an image we can boast of if we want to develop. We have therefore decisively started to tackle corruption. We are battling with it. It is always difficult but we are hell-bent to bring it under control, otherwise we cannot talk about development. The fight against corruption is another way of creating an eco-system that is favourable for businesses. NA: Morocco wants to be part of Ecowas, and possibly join other regional economic communities. Does your presence here send a strong endorsement for the Moroccans to become part of the regional economic bloc? President Bio: Well, the whole world is talking about creating large markets. Africa wants to create a continental market that has scale. Ecowas wants to do the same at the regional level. In sum, there are benefits to doing so, depending on your level of development and industrialisation. We have signed up to the African Union Continental Free Trade Area [AfCFTA] and I see no reason why we should not open up the markets as we allow people, goods, services and capital to move freely in the region. We should encourage the free movement and break the borders. I have no reason not to support Morocco to be a part of this West African market. NA: There is talk of a new scramble for Africa. The US National Security adviser, John Bolton, said in December that there is a power struggle between China, the Europeans and the Americans over the continent. Do you think we’re managing foreign interests properly as Africans? President Bio: I wouldn’t say we are managing it properly. I think as Africans we need to get together and discuss how we want to take part in this particular scramble. In my view we need to have a shared understanding of what it means. In as much as we are independent, I think in this particular situation we are facing a big threat, but [one] which can be an opportunity depending on how we handle it. NA: So if we don’t negotiate this properly, you think this becomes a threat? President Bio: Definitely. Every country is looking at its own interests; we should seek the interest of the continent. Because individually as countries it is better to have a collective approach so that we can have a stronger bargaining power. NA: But do we speak with one voice or not? President Bio: Again, this is a conversation that we should have. We haven’t had it yet, but we need to have it if we [are] to survive or come out of this particular scramble as winners. The conversation is just about making sure that whatever we do, or whatever any other country does, it is a win-win deal between us and those who want to come into Africa. We must make sure that we get our share in whatever is going to happen, we should not be victims at the end of it. NA: Coming back to Sierra Leone, during last year’s elections, the campaigning was quite divisive and potentially dangerous for a country recovering from a postconflict period. Would you say that the country is divided or united today? President Bio: It’s not as divided as people want to preach it. We definitely have bad politicians whose campaigns are not issue-based. These include those who prey on our citizens by playing the ethnic card. The former government did play the ethnic card very strongly in terms of jobs allocation. It was so bad that you could only share in the resources or become part of the governing system if you belonged to a particular ethnic group or a region. We are not interested in that. As a matter of fact, we intend to put an independent commission together to make sure that it pays particular attention to keeping the nation together. Why? Because some people are just bent on dividing it, because it serves their interests. It would not be in our interests to divide a little country like Sierra Leone. The purpose of that commission is to make sure that all ethnic groups and regions are kept together in peace and harmony and we can develop together as one nation, based on peace, a key prerequisite for any sustainable, sound development. NA: More broadly regarding peace in the region, is there cause for concern or do you think it’s being managed properly? President Bio: We have started managing it. I think the greatest threat I see is democratic regression. If people start to renege on their democratic credentials and want to again extend their stay in power, that is going to undermine the peace in the subregion. We have said that there should be term limits. It would be nice if leaders agreed to say, ‘my time is over’ and then bowed and left the stage. Any government wanting to continue beyond their agreed mandate is definitely going to create suspicion. It could lead to social upheavals. We want to entrench democratic norms in West Africa, and beyond, across the continent. I am pleased to note that we have made some progress even though we must go further. We’ve had a few peaceful democratic transitions. The tendency, or the refusal of some of our people to abide by this, is what is likely to lead to reverses in democratic consolidation in West Africa. NA: You’re from a military background but what would you say your management style is? President Bio: I mean as a military person, my style is based on discipline – following the rule of law. The rule of law is about making sure that the law rules. It is not what I want, it is what has been agreed upon and what is in the constitution. This include acts of parliament and the constitution, of course, the supreme document that regulates all our activities, including the President’s. NA: We have military men ruling in Nigeria, in Sierra Leone, in Egypt. Would you say that people are looking for more order and an end to indiscipline, the end of corruption? President Bio: Correct, and making sure that when you make a pledge, you keep to that because that is again about discipline. You spoke about a social contract. We made pledges, we have a manifesto. We have to deliver on the promises and the pledges contained in that manifesto. The people were yearning for leadership. They were yearning for hope, which is the last thing that any human being should ever lose. I think the little we have done has served as an example for people to know that yes, a disciplined approach, one that is genuinely concerned about the welfare of people and one that delivers promises, is what they need.